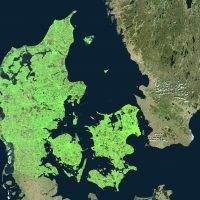 The Danish Agency for Data Supply and Efficiency (SDFE), part of the Danish Ministry of Energy, Utilities and Climate, has appointed TRE ALTAMIRA to process all Sentinel-1 A/B images collected over Denmark, along both ascending and descending orbits of the satellites, using SqueeSAR® technology. This is done as part of SDFE’s work towards setting up a national ground stability monitoring service and making it easily accessible to as many users as possible, from commercial and public entities to Danish citizens as well. 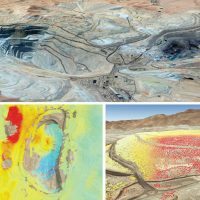 TRE ALTAMIRA has combined its capability to process large satellite datasets, such as those acquired by Sentinel-1, with the current industry standard of advanced InSAR techniques (i.e. SqueeSAR®) to generate a nationwide database of satellite displacement measurements, offering spatially dense and timely information on ground motion anywhere in Denmark. As a further step into reliability and quality of results, a robust monitoring service also depends on how many complementary sources of information can be integrated in order to calibrate results. SDFE provided our engineers with pre-existing information, including 3D GNSS data and an uplift model among others, that have been ingested into our processing workflow to extract millions of highly-reliable, ready-to-use satellite-based displacement measurements. Separate vertical and horizontal (east-west) measurement layers for operational use. We have delivered an additional database of vertical and horizontal (east-west) displacement measurements that are available for interpretation and integration with other surveying techniques. When satellite data acquired in both orbits are processed with SqueeSAR®, it is possible to retrieve vertical and east-west motion components for each measurement point identified. Denmark: vertical (on the left) and horizontal east-west (on the right) InSAR motion maps of the entire country. Satellite imagery: all Sentinel-1 A/B images collected over Denmark since 2014. 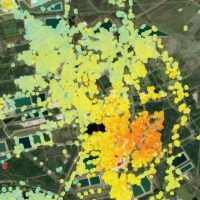 An overview of hotspots showing anomalous behaviours among millions of measurement points. Our trend variation analysis has provided SDFE with another layer of information. Trend variation is an automatic data-screening tool used to detect hotspots where a change in the trend of motion occurred during a certain temporal window. This serves as a tool to flag areas that may require further investigation and, potentially, remediation measures. Accessibility and dissemination of data are facilitated through TREmaps®. A wide range of users can access our intuitive, web-based platform TREmaps® to visualize and analyse all Denmark results. SDFE intends to update the InSAR database on a regular basis and integrate it into the future “European Ground Motion Service” by Copernicus when it becomes operational in a few years. You can also read (Danish news articles): 1) how the city of Odense has already utilised the nationwide deformation map of Denmark to detect those municipal defence levees that are being impacted by climate change here: https://bit.ly/2swMJ6U; and 2) how the National Road Authorities flagged a bridge for further investigation once satellite measurements indicated it was subsiding, here: https://bit.ly/2FDKc3r.